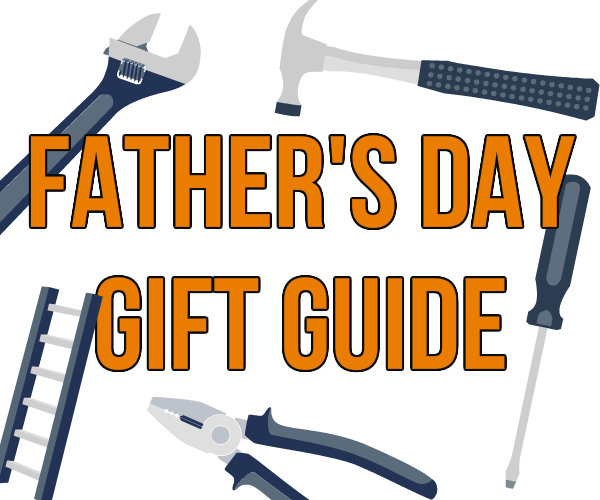 Father's Day is just around the corner and once again I have been requested to put out a gift guide. If I am being completely honest, I don't really like putting out these gift buying guides, because then I feel responsible if the gifts turn out to be duds. However, I understand that finding gifts that Dad will enjoy can be challenging at times. So I will give you some ideas of some tools I think are cool; just don't hold me responsible if your Dad doesn't like it; though he probably will, because all tools are cool. If you need even more gift ideas, be sure to check out my past gift guides. There, you will find tons of ideas with prices ranging from a few dollars up to thousands of dollars. Also be sure to check the Hot Deals section. Right now there are a few Father's Day exclusive deals and discounts. Who doesn't love a gift card to their favorite store? If you are not sure what to get Dad, a gift card is never a bad idea. Most of the items listed below can be purchased from Amazon, so if you are unsure about anything, you can send Dad a gift card with a link pointing to this guide. After my old dusk mask disappeared I went looking for something new, and what I ended up buying was the GVS Elipse P100. It is a great dust mask that features replaceable filters but it is not bulky like many other dust masks on the market. It is really comfortable to wear and breathe through. I use it on woodworking projects and for light paint spraying. They can be upgraded with carbon filters to cut out odors, which works even better for paint/finish spraying. Did you know that use can get very accurate distance measurements just by pointing a laser at a wall? I am a big fan of the Bosch Laser Measurers and every year they seem to make them better and cheaper. Their GLM 20 can measure up to 65-feet away with an accuracy of 1/8-inch with the single press of a button. It even has a backlit display. If you need more distance or accuracy, they have models for that as well. The Restorer made it on to my Christmas gift guide last year, but the tool concept is still so new that I don't think many people know about it. If your Dad does also of refinishing projects, like repainting wood or removing rust from metal, the Restorer might be the best tool for the job. With replaceable abrasive wheels, it can sand, buff, polish, and more. Check out my full review if you want to know more. To say I am a fan of Milwaukee cordless work lights is an understatement; anytime I am working in a dark room or inside a cabinet it is one of Milwaukee Cordless Lights that I turn to first. The new Milwaukee Underhood Light is designed to work under the hood of a car to provide a bright working environment. 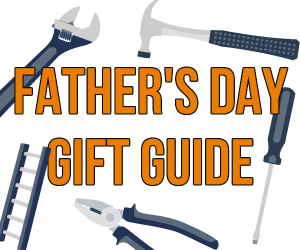 Unfortunately, it looks like the light will come out a few days after Father's Day, but if your Dad is a real gearhead he will probably think the wait is worth it. Skilsaw is a name that is recognized on any jobsite for a reason; the use of a worm gear in their circular saw gave their tool more torque and set them apart from the competition. Portable table saws are typically underpowered when compared to large stationary shop table saws, and this is noticeable when ripping through hardwood. By using a worm drive on a table saw, Skilsaw is able to give the saw more torque while still keeping it portable for jobsite use. Generac recently sent over their latest pressure and after only a few uses I can see that I really like it. Everything you need (minus fuel) to start pressure washing comes with the tool, including four different fan sizes that are suitable for many different washing needs. They also include a couple bonuses like a soap blaster, a turbo nozzle, and a pressure washing broom attachment. It can quickly go from blasting dirt off of concrete to gently washing a car. The OpenBuilds Mini Mill is just plain cool. It is a CNC router mill kit that is capable of milling out aluminum, wood, and so much more. If Dad is into fabricating in metal, he will get a kick out of the Mini Mill. The kit doesn't include a router or a control board and other electronic parts, but those are also for sale from OpenBuilds. The Portable Power Station from DeWalt turns the power of four 20V and/or Flexvolt DeWalt cordless tool batteries into 120V AC house current. This means it can use DeWalt tool batteries to power just about anything you can plug into a home wall outlet. Not only is this great for making corded tools portable, it doubles as a great power source in case of an emergency. As long as you keep the charged it is good to go. Check out my review if you want to know more.